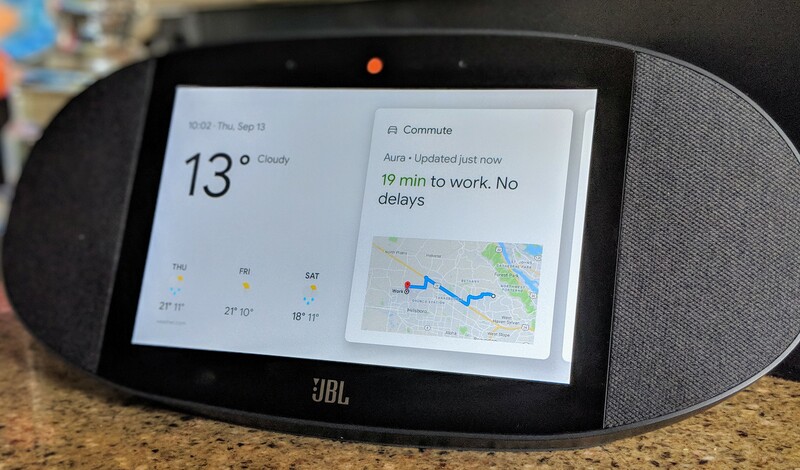 If you’re looking for a smart display that’s powered by the Google Assistant, you now have two choices: the Lenovo Smart Display and the JBL Link View. Lenovo was first out of the gate with its surprisingly stylish gadget, but it also left room for improvement. JBL, given its heritage as an audio company, is putting the emphasis on sound quality, with stereo speakers and a surprising amount of bass. In terms of the overall design, the Link View isn’t going to win any prizes, but its pill shape definitely isn’t ugly either. JBL makes the Link View in any color you like, as long as that’s black. It’ll likely fit in with your home decor, though. The Link View has an 8-inch high-definition touchscreen that is more than crisp enough for the maps, photos and YouTube videos you’ll play on it. In using it for the last two weeks, the screen turned out to be a bit of a fingerprint magnet, but you’d expect that given that I put it on the kitchen counter and regularly used it to entertain myself while waiting for the water to boil. At the end of the day, you’re not going to spend $250 on a nice speaker with a built-in tablet. What matters most here is whether the visual side of the Google Assistant works for you. 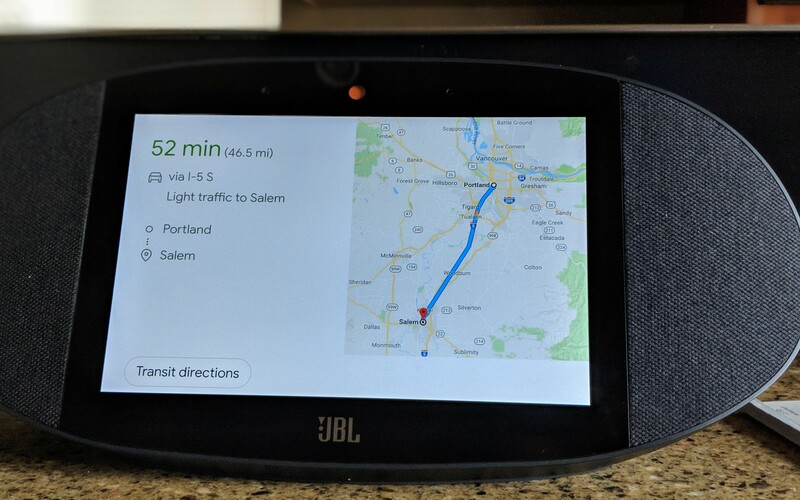 I find that it adds an extra dimension to the audio responses, no matter whether that’s weather reports, a map of my daily commute (which can change depending on traffic) or a video news report. Google’s interface for these devices is simple and clear, with large buttons and clearly presented information. And maybe that’s no surprise. These smart speakers are the ideal surface for its Material Design language, after all. As a demo, Google likes to talk about how these gadgets can help you while cooking, with step-by-step recipes and videos. I find that this is a nice demo indeed, and thought that it would help me get a bit more creative with trying new recipes. In reality, though, I never have the ingredients I need to cook what Google suggests. If you are a better meal planner than I am, your mileage will likely vary. What I find surprisingly useful is the display’s integration of Google Duo. I’m aware that the Allo/Duo combo is a bit of a flop, but the display does make you want to use Duo because you can easily have a video chat while just doing your thing in the kitchen. If you set up multiple users, the display can even receive calls for all of them. And don’t worry, there is a physical slider you can use to shut down the camera whenever you want. The Link View also made me appreciate Google’s Assistant routines more (and my colleague Lucas Matney found the same when he tried out the Lenovo Smart Display). And it’s just a bit easier to look at the weather graphics instead of having the Assistant rattle off the temperature for the next couple of days. Maybe the biggest letdown, though (and this isn’t JBL’s, fault but a feature Google needs to enable) is that you can’t add a smart display to your Google Assistant groups. That means you can’t use it as part of your all-house Google Home audio system, for example. It’s an odd omission for sure, given the Link View’s focus on sound, but my understanding is that the same holds true for the Lenovo Smart Display. If this is a deal breaker for you, then I’d hold off on buying a Google Assistant smart display for the time being. You can, however, use the display as a Chromecast receiver to play music from your phone or watch videos. While you are not using it, the display can show the current time or simply go to blank. 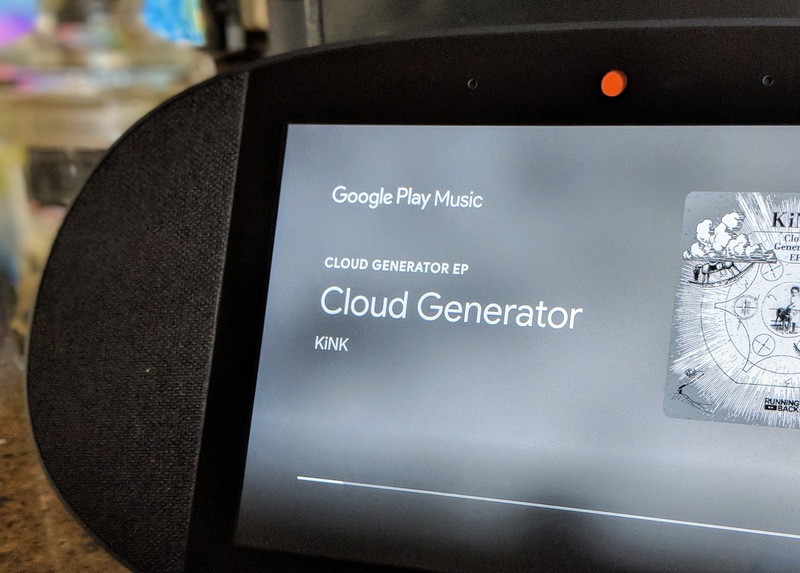 Another thing that doesn’t work on smart displays yet is Google’s continued “conversation feature,” which lets you add a second command without having to say “OK, Google” again. For now, the smart displays only work in English, too. When I first heard about these smart displays, I wasn’t sure if they were going to be useful. Turns out, they are. I do live in the Google Assistant ecosystem, though, and I’ve got a few Google Homes set up around my house. If you’re looking to expand your Assistant setup, then the Link View is a nice addition — and if you’re just getting started (or only need one Assistant-enabled speaker/display), then opting for a smart display over a smart speaker may just be the way to go, assuming you can stomach the extra cost.